Since 2000 the US has spent about $7 billion fighting drug production in Colombia and training its army to battle rebel groups. The yearly US budget for Plan Colombia is decreasing: 2010 - $237.8.2 million, 2011 - $178.6 million, 2012 - $189 million. At first sight the results are looking successful: Serious blows have been struck to the FARC and Colombian Cocaine production has gone down 60% since 2000 according to UNODC. But was it really that successful? Of course there is a big downside on this story. Just think of the negative effects of aerial eradication. Because of this, coca cultivation has now spread over the whole country of Colombia. The number of provinces where coca is being grown rose from twelve to twenty-two. Where aerial eradication halted drug cultivation in one area, it would simply appear in another area. Also many residents of spray zones have shown to have a variety of skin, respiratory, and other ailments while many other crops have been destroyed too. 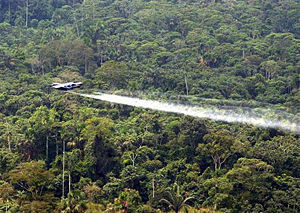 Fumigation also left hundreds of thousands farmers nationwide displaced. In terms of environmental effects and because of the “balloon effect”, farmers end up moving their crop cultivation into forests and national parks. As a result, there has been deforestation, pollution of soil and waterways, and even increased risk of extinction for Colombian bird and plant species. Drug monies are fueling the domestic conflict (FARC and Paramilitaries) in Colombia for decades already. Increasing corruption and violence is another huge side effect. Unfortunately there is also a regional balloon effect. The decrease in cocaine production of Colombia resulted in an equal increase of production in Peru and Bolivia. During the 1990s, President Alberto Fujimori militarized the valleys in central Peru to crush the Shining Path, lowering cultivation levels. In 2010 many farmers are planting coca once again. Peru has become no. 1 cocaine exporter in 2010. Production in Colombia is still larger than Peru, but thanks to more seizures in Colombia the net export of Peru is larger. American anti-narcotics aid for Peru stands at only $71.7 million in 2010, slightly higher than 2009’s $70.7 million. At the same time we see an uprise of the activities of the Maoist Shining Path (Sendero Luminoso) rebels over the last years in Peru. They seem to have adapted the FARC's business model to finance their goals. A militant faction of the Shining Path called Proseguir (or "Onward") continued to be active. The Peruvian government claims that Proseguir is operating in alliance with drug traffickers. Since August 2011 the Peruvian government has temporarily suspended the eradication of illegal crops to redesign its drug policy. A similar story can be told about Bolivia. Bolivia has seen a 70% growth in the cocaine industry in recent years, though that country remains third in overall production. The coca-cocaine circuit is the third largest source of revenue for the country, right after the exports of traditional products such as hydrocarbons and mining. The country's cocaine industry is growing at an alarming rate. Cocaine seizures have been increasing and laboratories using processing methods long used in Colombia are mushrooming. The processing labs are increasingly sophisticated and can produce more and more cocaine. Drug-related violence is increasing. Recent months have seen a number of shoot-outs between gangs of drug-smugglers. In 2009 Morales ordered a stop to operations by the US Drug Enforcement Administration in Bolivia, accusing the agency of having encouraged anti-government protests in the country in September. The US government had earlier added Bolivia to a list of countries that it said had failed in their counter-narcotics obligations. The U.S. announced a $4 million reduction in drug control assistance for 2010, leaving $35 million. Bolivia is getting some aid from Russia now. The sacred leaf of coca has been used by Andean peoples for thousands of years in a peaceful and/or religious way. 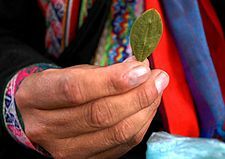 A small amount of cocaine that naturally exists in the coca leaf helps to cope with altitude sickness while also alleviating hunger and relieving fatigue and exhaustion. The Spanish conquerors considered the herb the work of the devil and banned its use, until they realized that their slaves in the Peruvian silver mines could work 16 hours a day if they chewed coca leaves. An Andean coca-chewer might get through 30 grams of leaves in a day, which yields the equivalent of 150 milligrams, or an average-sized line of cocaine. The effect by the slow, steady and safe absorption of coca through the mouth and stomach is 100 times weaker than snorting a line of pure cocaine. In 1850 the active ingredient of coca was identified and called cocaine. The cocaine production process turned out to be very simple and cheap. Cocaine reached the height of its popularity in the 1880’s and was incorporated into many cough tinctures, pain killers, mood-brighteners, chewing gum, wine, soft drinks and so on. Use of cocaine was considered harmless. At these times two servings of Coca Cola contained as much cocaine (140 mg) as a line of cocaine today. Sigmund Freud touted it as a ‘miracle’ drug that could combat depression and impotence; he was a heavy user himself. Cocaine was also heavily used by soldiers in World War I. US demand of cocaine really started to take off in the seventies. Colombian Cartels dictated pricing and took over the production, trafficking and distribution for the US market in the eighties. US authorities had great trouble to enforce domestic anti-drug policies. The huge profits that were made, enabled the Colombians to bribe almost anybody. The retail of cocaine on the streets was left to the Sicilian mafia, gangs and other organized criminals. Because fighting the cocaine-flood seemed so difficult, the US politicians thought that persecution of cocaine users was the right response, meanwhile the CIA and DEA got involved in the trade themselves. When US politicians noticed the effect of their anti-drug campaign was counter productive, they thought that they would get more bang for their buck if they would fight the Colombian supply-side. So Plan Colombia was born. We now know that this didn't work either and it certainly didn't work for Latin America. The only option that the US politicians haven't tried yet is the combination of education, decriminalizing and rehabilitating all drug-users and regulation of drugs. This combination of measures has worked to some extent in other countries than the US, but seems extremely difficult to implement in the US. It's obvious that the US policy to control the supply side of drugs has not been very effective (understatement) and causing great instability all over Latin America. Many critics urge the US Administration to re-balance the drug control budget to include more funding for drug demand reduction and less for drug supply reduction. The US ONDCP 2010 budget ratio supply-side/demand-side is 65/35, while in 2002 it was still 55/45. The 2010 UNDCP report shows that the US has the world's 3rd highest figure regarding "Annual Prevalence of Use as a percentage of the population aged 15-64" for cocaine (2.6), 11th for Cannabis (12,5) and 26th for Opiates (0.58). However the global trend for cocaine is slightly downward for the last years, because cheaper illicit drugs entered the market.